From the 29th of September to the 1st of October, for 48h, activists, journalists, dataviz specialists and coders will gather to dive into the 2014-2017 EP votes data and try to make sense of it! 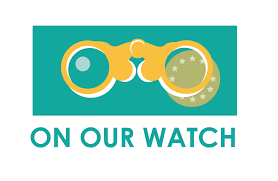 Born from the 2016 Citizens for Europe Projects Fair, #OnOurWatchEU is a collective initiative based on co-creation. It brings together European civil society organisations and offers them a platform to assess the work of the European Parliament on a wide range of issues with the aim of informing citizens and generating debate. IHECS Academy, Rue des Grands Carmes 27, 1000 Brussels. Register here! For the participants from the activist/policy specialist sector, priority will be given to On Our Watch partners.